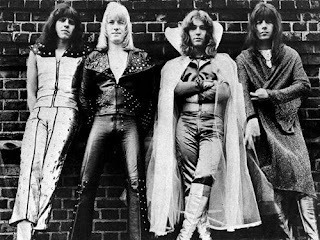 NEW MUSIC EAR'S PERSONAL PLAYLISTS - "THE SWEET"
The Sweet's debut album "Funny How Sweet Co-Co Can Be" was a great first album of quirky Glam Rock and Classic Rock. I chose 7 of the 12 tracks for my playlist. The singles "Funny Funny" with its hint of Soul and Motown and the tribal Indian sounding "Co-Co" are here. The cover of The Lovin' Spoonful's "Daydream" and the brilliant B-sde that is "Jeanie" make the list. "Chop Chop" is similar to "Co-Co in its bare bones sound while the final two songs are Classic Rock standards of the time, "Done Me Wrong Alright" and "Spotlight". 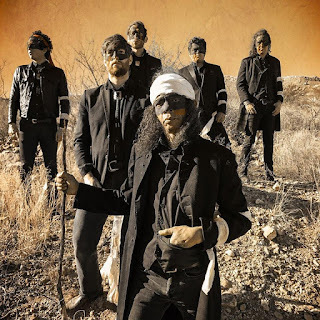 NEW MUSIC PROFILE - PSYCHEDELIC CUMBIA ROCK BAND "XIXA"
XIXA (pronouced "she-sha") are a quirky, amazingly talented and incredibly strange, genre crossing band from Tucson, Arizona in the U.S.A. This is a really great band of musicians, Brian Lopez and Gabriel Sullivan are the key men behind this groundbreaking new sextet. Ironically, dressed as possibly the new Magnificent Seven (or should that be six) western heroes, thay have a brand of seemingly gothic, psychedelic, Mexican style Rock that simply captivates the senses. 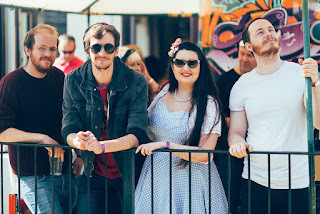 Ten Millennia are a six piece funky grooves band from Yorkshire. Consisting of Rosie (vocals), Wayne (keys), Russell (sax), Rich (guitar), Colin (bass) and Jules on drums. Their self titled debut album was released in 2017. For the last few years the band have toured and played gigs all over the country supporting the likes of The Corrs and Jools Holland and his Rhythm & Blues Orchestra. The back story of the band started when a man called Derek advertised in a newsagent window asking for "aging rock and rollers" to get in touch. Drummer Jules got in touch and the band was born. Derek has since suffered from a long debilitating illness so no longer plays with the band. However, they continually dedicate their music to recognise the founding member and the affection they still have for him, which is nice. 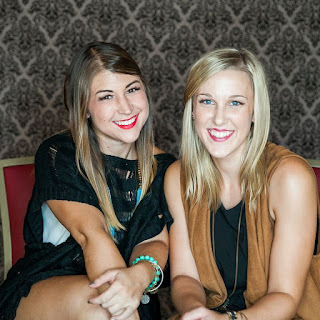 NEW MUSIC PROFILE - COUNTRY FOLK BAND "STEEL BLOSSOMS"
Country-Folk duo Sara Zebley and Hayley Prosser moved from their hometown in Pittsburgh, USA to Nashville to pursue their dream. 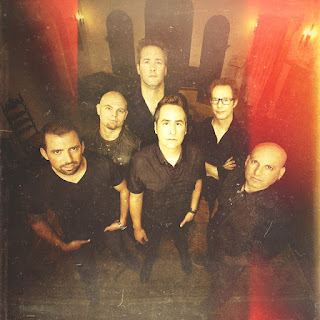 Steel Blossoms the band was created in 2014 after the pair met at a local festival in 2008, after multiple performances every week they created a large fan base all over Western Pennsylvania. Nasville beckoned in the background and the move was hard but the girls haven't looked back and still have their Pittsburgh roots and personalities intact. The girls play full time every week around Nashville, and their closeness to their fans is paramount to their success. They give a personal touch to their fans, sometimes playing "house concerts" to families they have met, they joke and share stories with their fans at concerts and seem to be just down to earth, genuine girls who like to spread a little happiness and positivity around. That's never a bad thing and more bands should take a note or two from these girls! NEW MUSIC ALBUM REVIEW - BILLY CRAIG - "SONIC TUNESMITH"
ALBUM SUMMARY - As well as playing shows as lead guitarist with legendary Rock band Brownsville Station, Billy Craig has released three albums before this one. Building his fan base and honing his storytelling lyrical style while merging influences and genres make this guy a force to be reckoned with. 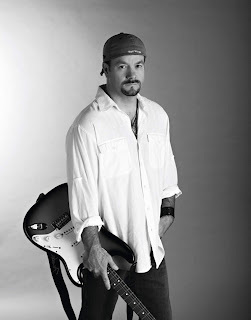 "Sonic Tunesmith" has a hint of Country twang but will rock your socks off. There is something for everyone ranging from ZZ Top blues to Bon Jovi style ballads and vocals reminding us of Tom Petty and Bob Dylan. Throw in some great Rock guitars and good old fashioned Rock N' Roll and you have a fantastic album. Sam Walker (vocals/bass/rhythm guitar), Shelley Walker (lead guitar/backing vocals), Laura Ozholl (vocals/guitar/bass) and Debbie Wildish (drums) are JOANovARC, the exciting new girl Rock band from London, U.K. Blasting onto the music scene with their first two singles "Live Rock n Roll" and "White Trash" they have been blaxing a trail around the globe with some electric live performances, supporting the likes of Slade, Adam Ant, Girlschool, Bonnie Tyler, Toto and Marillion. From 1979's debut album, the brilliant raw but brilliant "One Step Beyond..." I chose 6 great tracks. The insrumental masterpiece that is the title track and the tribute to Jamaican Ska musician Prince Buster, "The Prince" (also the band's debut single) are included here. The mysteriously Jazzy "Night Boat To Cairo" and the quirky "Bed And Breakfast Man" are on my "mad" playlist. One of my favourites by Madness, "My Girl" and to finish off from this abum, the self titled, "Madness". From the band's 1973 self titled debut album, when they were just a great Classic Rock band I chose the one outstanding track for me, "Keep Yourself Alive". There was actually a first version of "Seven Seas Of Rhye" on the album but it was a very short instrumental, I didn't include this one!. 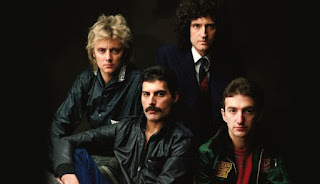 From 1974's "Queen II" there was only one track I could pick, the superb "Seven Seas Of Rhye", as previously mentioned this was half written at the time of their debut so the instrumental version was included there. This version is totally different to what they initially thought it would be come, a blistering Rock track with a comedic style ending of "I Do Like To Be Beside The Seaside". Class!